First I'd like to start off with that this is my first script ever! Well sorta seeing its modded. I did this by looking at the rtp scripts and I now can make a menu system! HOORRAY!!!! Yea I know anybody could've done this. But I'd thought I share it anyway. 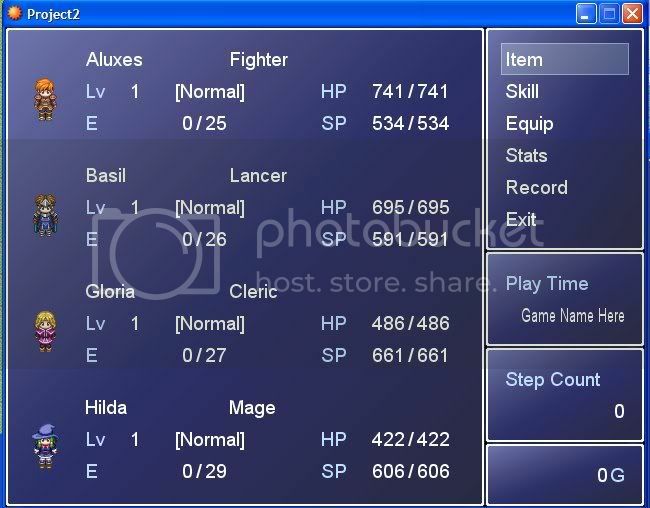 A modded default menu system that has a few new features than the real one. All windows are mirrored from the first one. #Now has a mirror effect. #End Game. Also you need to enter your game Name in actor 10. # This window displays the name of your game. They are in script but here they are again. enterbrain - for making the maker and having the scripts for me to look at. Remember to have 10-13 in actors open in your database so you can name the words. Saving you three slots in the actors. I like the mirrored idea though. Game_Name = 'Game Name Here'. That saves an actor. And try adding using that to configurate with. Remember this is criticism I dont mean to offend you if I did. If you need help with doing what I suggested just ask. @Game_Guy: Im going to use this as a template for a reverse menu for my game ok? EXTRA:Energy up because you gave me the x position for reverse menus.